Unlicensed aerodromes and private strips are often used by pilots and private owners. They may be more convenient or cheaper than licensed aerodromes; however they do require special consideration. Approximately one third of GA Reportable Accidents in the UK occur during take off or landing at unlicensed aerodromes. The proportion of flying activity is not known. It is important to realise that the criteria of your aviation authority for the licensing of an aerodrome, e. g. clear approaches without power or other cables, no trees or obstructions close to the runway and so on, are unlikely to have been applied to the strip. Since in almost all cases Prior Permission is Required (PPR) before landing, your phone call should also include discussion of any difficulties, obstructions, noise sensitive areas to be avoided and the useable length of the strip. Find out the arrangements for grass cutting. It is no use landing only to find the grass is so long that it prevents you taking off again. As a rule of thumb, the grass length should not be more than 30% of the diameter of the wheel. Use an detailed map to find out accurately the elevation above mean sea level of the strip –check your map to see if it is in metres or feet! The orientation of the strip may have been laid out to fit in with the needs of agriculture. Establish the direction of the prevailing winds in the area and note the location of any windsock. Will it be affected by nearby trees or buildings? A well located windsock will give you the ground level wind speed and direction. Beware of strips near the coast; sea breezes can change rapidly from onshore to offshore, morning and evening. Tell the operator of the strip what experience you have, which strips you have used recently, and what aeroplane you intend using. He has probably seen pilots with similar aeroplanes flying into and out of the strip and you can benefit from local knowledge. He does not want an accident any more than you do! Exchange telephone numbers in case of a last minute hitch. If possible visit it by road to see for yourself. The length of the strip must be accurately established. If you pace it out, remember an average pace is not one metre, but considerably less (the British army’s marching pace is only 30 inches). This may decrease still further after walking several hundred metres. A proper measuring device is better; for example a rope of accurately known length. The strip should be adequately drained or self-draining. Visit it after heavy rain to see whether it remains waterlogged or muddy. Rain after long dry periods may not soak away and can remain hidden by the grass. The surface should be free from ruts and holes and should be properly and regularly rolled. One way of assessing the surface is to drive a car along the strip. If at about 30 mph the ride is comfortable, there should be no problems. 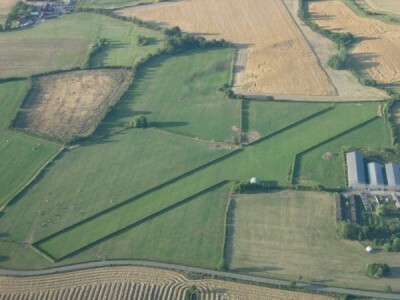 If it is a disused wartime airfield, some of the runway may be unusable, while other parts may have a surface in poor condition – including loose gravel and stones. These can be picked up by the propeller wash and can damage windscreens, tail and, of course, the propeller itself. Stone damage can be very expensive. Carefully examine from the ground, air or maps the approaches to the strip and the go-around area, with particular reference to any runway slope, obstructions or hills within 5 km, windshear or turbulence from nearby woods/ buildings and other considerations. Look closely at neighbouring properties; a climb out above the breeding pens or stud farm next door will soon bring an end to everyone's operation. Aeroplane performance must be appropriate for the proposed strip. You must be fully familiar with the performance characteristics of your aircraft. Remember, the figures shown in the Pilots Operating Handbook are obtained using a new aeroplane, flown by an expert pilot under near ideal conditions, i.e. the best possible results. On the strip, the grass may be different from the 'short, dry, mown grass' of the Handbook. There may be a slight uphill gradient, tall trees or cables at the far end, or a cross wind. Short wet grass should be treated with utmost caution, it can increase landing distances by 60% – it’s like an icy surface! Take account of all of these most carefully and then add an additional margin for safety before deciding. You should allow a 33% safety factor for take-off but 43% for landing. Your own abilities as a pilot need critical and honest assessment. The ability to land smoothly on a long hard runway is very different from the skills needed for this type of operation. Some strips are located on hills where, up to a certain wind speed, take offs are downhill and landings uphill. Re- read the above paragraphs, for although such strips are not necessarily dangerous, they should not be attempted unless you are totally confident about the factors described above. You must check that the insurance covers operation from an unlicensed aerodrome or a strip. It is important that you give Insurers fullest possible written details before the visit. Find out about the local arrangements for booking in and booking out; usually a Movements Log is provided. Ensure that passengers and spectators are properly briefed about where they may go, where they may stand and what they may or may not touch. Leave details of route, ETA and passengers in the Movements Log AND with someone who will react appropriately and alert the Emergency Services if you fail to arrive/ return. If you intend to leave the aircraft overnight at a strip, it may be necessary for you to arrange your own tie- downs and wheel chocks. Ensure that control locks are in place and the aircraft is properly secured. If the wind is likely to increase, then position your aircraft so as to minimise the possibility of it moving and be prepared to reposition it if the wind direction changes. Covers should be used to keep insects and water out of the pitot tube and static vents. Next morning your pre- flight inspection should be more careful than usual just in case birds or other wildlife have taken up residence; birds can build a nest overnight. Check the pitot head, static and tank vents for insects. If the strip is shared with cows, horses or sheep, then an electric or other suitable fence to separate them from your aeroplane is essential. Cows are very partial to the taste of aeroplane dope and their rough tongues have been known to strip fabric from wings. Metal aeroplanes do not escape their attentions, since they make suitable back-scratchers. Discuss with the strip operator the security of the aeroplane. Vandalism and fuel thefts may be a problem. Consider having a familiarisation flight to and from the strip with a pilot who knows the strip and is both current on your aeroplane and operations into grass strips. In any case you must know and fly the correct speeds for your aeroplane and remember the importance of using appropriate techniques, keeping the weight off the nosewheel etc. If the strip is shorter than you are used to or has difficult approaches, you should arrange for a flying instructor to appraise your flying skills and revise and improve short field, soft field, general circuit and airmanship skills. Listen and learn. If an instructor is not available, at least practice your short landings on a long runway before attempting to land at a short strip. Airmanship and look- out must be of the highest order; there is unlikely to be any form of ATC service to advise you of the presence of other aircraft, their position or intentions, so be especially vigilant. Low flying military aircraft may NOT avoid strips. Circuit practice at unlicensed aerodromes could be unpopular with the neighbours and may be in breach of part of Rule 5 of the Rules of the Air if you are within 500 ft of persons, vessels, vehicles or structures. However, if you find a problem with turbulence or crosswind, surface or slope, do not hesitate to go around in accordance with normal aviation practice. Plan your circuit using the best available QNH, for example from a nearby aerodrome. Failing that you could use the most recent ‘regional pressure setting (RPS)’ but be aware your altimeter will certainly over-read if you use RPS. You should already know the elevation of the strip, so add this figure to the appropriate height that you would use in a normal circuit. Thus, if the strip is 250 ft amsl, downwind will be e.g. 1250 ft QNH. Get into the habit of flying a compact circuit using engine and propeller handling techniques that will minimise noise disturbance. Avoid long flat and noisy approaches, these are not conducive to good neighbourliness nor necessarily the best short landing technique. If your approach is bad, make an early decision to go-around. It is often useful to plan to make a go-around from your first approach (avoiding persons, vessels vehicles and structures by 500 feet). Note carefully the position and height of any obstructions on the approach especially hard- to- see local power and phone cables. Make sure that you can clear them (and any crop) by an adequate margin, and provided that you maintain this clearance, always aim to touch down close to the threshold – not halfway down the strip. Always start your take off run as close as possible to the beginning of the strip, unless there are very good reasons not to do so. Work out an acceleration check point from which you can stop if you haven’t reached sufficient speed to make a safe take-off. Bear in mind when turning off the strip, Rule 17(7) of the Rules of the Air and other arriving aircraft. When performing power checks or engine runs try to minimise any noise nuisance and ensure that the slipstream is not creating a problem. Unexpected noise etc can terrify livestock; be considerate when choosing the site for engine checks. After take off, reduce power and propeller rpm when it is safe. Climb to at least 500 ft agl before turning. If you are a regular strip user, decide your weather and wind limits and be clear about your Go/ No Go decision process. DO obtain permission from the owner/operator prior to visiting the strip. Talk to pilots who have used the strip before and can advise you on procedures/obstructions. DO check that the combination of you and your aeroplane can safely cope with this strip. DO always leave details of ETA route, destination and how many are on board in the Movements Log. DO always nominate a ‘responsible person’ who knows how to raise the alarm if you fail to arrive/return. DO follow the requirements for customs, immigration and the Terrorism Act if flying to or from overseas. DO talk to neighbouring aerodromes or to the Flight Information Service on the radio. DO build up a working relationship with your nearest aerodrome. You may need them for fuel, weather information and maintenance. DO be ready for unexpected effects from trees, barns, windshear, downdraught, etc. DO work hard at being a good neighbour and improving the Public’s perception of General Aviation by minimising noise nuisance. DO check that the strip really is long enough, with a 30% margin for safety. DO check on the effect of power and other cables. DO check whether any slope makes it a ‘one way’ strip. DO NOT 'beat up' the strip or engage in other forms of reckless, illegal and unsociable flying. DO NOT attempt to take off or land if the grass is long, the ground is muddy or weather is marginal. There will always be a better day to fly or you can always divert into a neighbouring aerodrome. DO NOT run- up an engine where the noise affects others or slipstream can be a nuisance. DO NOT attempt to 'scrape' in from a bad approach.